Fatsur is a company born in the year 2000 focused on the treatment of oil from power transformers. Among the most outstanding clients are the main transformer manufacturers and electric power distributors. The trajectory followed during these years has given rise to the consolidation at a national level and the opening of doors at an international level. • Achieve customer satisfaction, providing feasible solutions. • Promote continuous improvement and innovation, including the latest technologies. • Achieve the maximum quality projected towards the final user, in all our services. • Carry out the work, always ensuring the safety of our employees, with all the means at our disposal, both materials and continuous training. • Adapt our actions to always keep in mind the protection of the Environment. 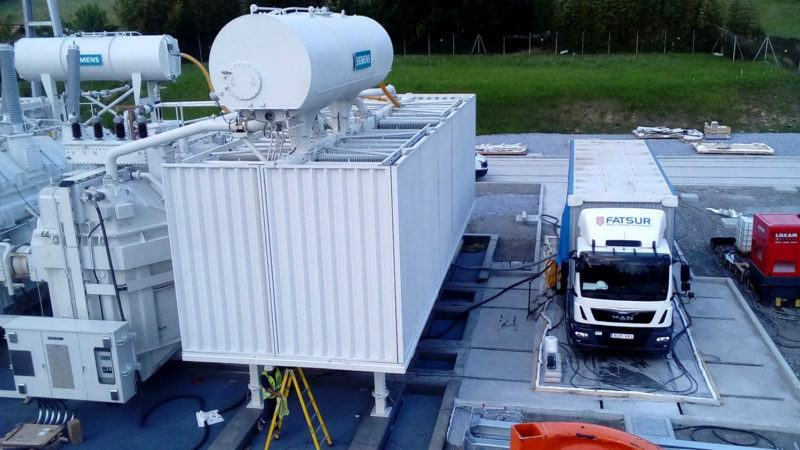 Thanks to all this, Fatsur has experienced a great growth in recent years, which has made it a company entrenched in the electrical sector, focused on the maintenance and assembly of transformers, as well as the coating with polymeric material of the insulating elements of the electrical substations. All this has made possible, that our scope of work has exceeded our borders. Fatsur aims to stand out in its scope, and achieve the total satisfaction of the tooth through collaboration and teamwork, encouraging and encouraging the participation of all. This commitment and effort, makes our work efficient, responsible, effective and competitive, in addition to continuing the growth and consolidation of the continuous improvement that differentiates us. FATSUR is a company dedicated to the maintenance and installation of power transformers, in which respect for the environment has been considered as a strategic and primordial factor to maintain a high level in the provision of its activity. At FATSUR we are committed to developing our activities with due respect for the Environment, and to continuously improve our environmental practices. For all this, our objectives included the development and implementation of an Environmental Management System in accordance with the UNE-EN ISO 14001: 2004 Standard, applicable to the development of our business activity, supported by this Environmental Policy. Incorporates within its business strategy, the definition and publication of a policy that includes its principles of action, for the protection and prevention of environmental pollution and that, guiding all activities carried out, serves to confirm the commitment to continuous improvement of our company in this field of action. All our activities will be carried out within the commitment to comply with the legislation and other requirements that the company voluntarily subscribes in environmental matters. It will promote in the process of its activity, the reduction, reuse and recycling of materials and the reduction of the consumption of natural resources. Adopt the precautionary principle when identifying negative environmental impacts. It undertakes to use the best available techniques, to avoid or remedy emergency situations during its activity, in its own facilities or those of third parties. It will establish quantifiable goals and objectives, aimed at preventing, controlling and minimizing the environmental impact of its activity. It will have the appropriate mechanisms and means for the development, review and compliance of this policy and the Environmental Management System, and will be committed to maintaining it, directing its efforts towards the search for a greater degree of environmental compatibility in carrying out the processes productive. It will work with suppliers and collaborating companies in order to improve their environmental actions. FATSUR provides adequate training for staff, and encourages them to develop good environmental practices at work and obtain compliance with environmental objectives. FATSUR is committed to making this environmental policy known to all its employees, suppliers, customers, the general population and other interested parties.